My sewing plans for this long weened were a bust. Saturday morning TDF informed me that his buddy was coming over for a visit, he ended up staying for dinner. Sunday TDF suggested going for dim sum and I couldn’t say no, it’s my favorite. Then we were invited to friend’s for dinner so all I got done was ironing and a little bit of cutting. Monday was more cutting, pattern matching, which took forever, and laundry. I finally finished TDF’s paisley shirt, made button holes, attached buttons and hemmed sleeves. I tried to make button holes on TDF’s field coat but as usual, the Sapphire didn’t want to play nicely on heavier fabric and, after ripping out 4 failed attempts, gave up. I’m going to give the Brother HE-240 a shot at it and see if it can do any better. I’d like to use the top stitching thread but we’ll see. I practiced hand sewn button holes but because the fabric kept fraying, I couldn’t get a perfect line of stitching. Using an upholstery needle didn’t help either. I’m going to make another attempt using a sharp needle on the way home in the car. 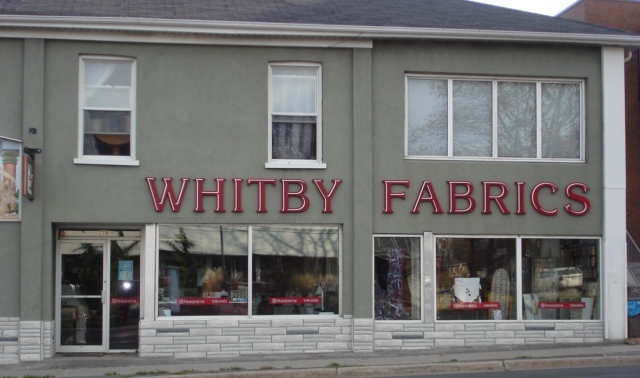 Whitby Fabrics is up for sale. I wish I could afford to invest in it, I’d bring in Brother machines for those who can’t afford Husqvarna. I’d might even get rid of the Husqvarna line altogether if there wasn’t already a Baby Lock dealer in town. A girl can dream, can’t she? Today is our 10th anniversary, TDF and I will be going to TOCA for lunch today.